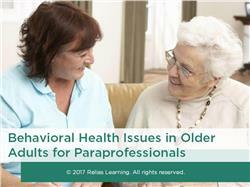 As health and human service paraprofessionals assisting older adults, it is important for you to recognize the behavioral health problems that arise most often in older adulthood. The Center for Disease Control’s 2013 publication, The State of Mental Health and Aging in America, estimates that 20% of people 55 and older experience a behavioral health problem that causes suffering. Unrecognized and untreated, these older adults will experience more disability and lower quality of life. The current workforce is challenged by the need to provide for the behavioral and other health needs of our increasing population of older adults as the Baby Boomers age and the lifespan gets longer. Your role as a paraprofessional is becoming even more central to meeting the needs of older adults. This course is designed to increase your ability to distinguish between normal aging and behavioral health problems, and to further your understanding of what you can do as part of the care team to provide support and promote recovery. Explain the interactions between normal aging, physical illness, and behavioral health. Recognize the symptoms of common behavioral health disorders in older adults. Detail how you can work effectively with others in the client's formal and informal support networks to improve services. Describe ways that you can provide support to improve the behavioral health functioning of older adults. 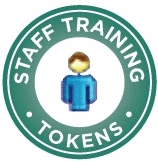 The target audience for this course is: entry level Direct Care Workers; entry level Direct Support Professionals; in the following settings: Health and Human Services.